But we have a hunch that the software is going to be the real star (or goat) of the launch. Hurricane Joaquin may be skipping New York City, but Microsoft's own maelstrom of hardware is still expected to hit October 6—most likely three new Lumia phones, an updated Surface Pro 4 tablet, and a new Microsoft Band. You’d be forgiven for thinking that Microsoft’s device business will steal the spotlight. But their success could arguably turn on something else: software. Somewhere within Redmond, Microsoft executives are making a choice: Do they show Microsoft’s new flagship phones running the safe, stable, and established Windows Phone 8.1 OS? Or will this be the official coming-out party for Windows 10 Mobile? That’s just one of a swirl of storylines as Microsoft readies its launch. Then there are the rumored flagship Lumia phones, the Lumia 950 and 950XL, which have appeared seemingly everywhere but the event itself and are the first premium Windows phones in over a year. (Microsoft may also launch a third phone, the Lumia 550.) Then there’s the launch of the second of the Band fitness trackers, a product Microsoft never seemed all that committed to as the market for wearables cools. The most boring part of the launch could be the one that Microsoft should be most excited about: the Surface Pro 4, a refresh of Microsoft’s powerful productivity tablet that’s nearing a billion dollars in revenue per quarter. PCWorld will be reporting live and providing our hands-on impressions of what we’re allowed to touch and feel. So what is going to be there? Here’s our best guess. The Surface Pro 3 that launched about 17 months ago was finally the Windows tablet everyone wanted. Its success turned on its design: a svelte, streamlined productivity PC that just so happens to be a tablet. Microsoft’s Surface business raked in $888 million in revenue during the June calendar quarter, and it’s certainly possible that Microsoft could disclose that it topped a cool billion for the just-completed third quarter. 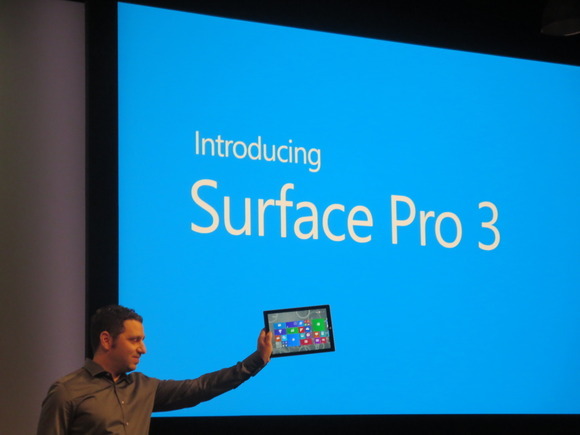 Microsoft’s Surface Pro 3 shown on stage in May 2014. If Microsoft announces a Surface Pro 4, many expect it will include Intel’s new Skylake chip for increased performance. I would like to see a Windows Hello camera built in to enable biometric logins, but the recent launch of the Lenovo Miix 700—with a rear-mounted Hello camera—makes that a bit doubtful. One rumor also claims that the Surface Pro 4 will essentially do away with the bezel — on all but the side with the Windows button, presumably. Tom Warren of The Verge suggests that the SP4 could have a 4K or even 5K display, to go along with a new stylus, and perhaps a fingerprint reader. I’d hope for the latter but not the former, because I’d rather not have a high-res display eating away all my battery life. Warren also suggests that Microsoft could be preparing a monster of a surprise: a full 14-inch “laptop”-y version of the SP4, compared with the 11.6-inch display we’re used to with the Surface Pro 4. This is a reasonable and intriguing possibility, though you'd have to balance a larger size's greater productivity against its impact on portability. One angle slightly worries me: Six months ago, a USB-C connector was considered the hot new I/O direction, because of its blazing throughput, ease of use (you can align a USB-C connector in either direction) and the fact that you can route power through it as well. The SP3 has just one USB-3 port. The problem is this: there aren’t any USB-C charging-and-I/O dongles available today. If an SP4 includes just one USB-C port—and we don’t know if it will—you won’t be able to charge the tablet and use it to drive an external display until those dongles ship. Finally, there are the other Surfaces you need to worry about—the ones that don’t come from Microsoft. Lenovo already announced its Miix 700 at IFA, which falls between the Surface 3 and the Surface Pro 3 in terms of specs. VAIO (the spinoff brand formerly owned by Sony) has its own Surface clone, the $2,199 VAIO Z Canvas, and we’re hearing rumors of yet another waiting in the wings. Ladies and gentlemen, the Surface clone is going to be a thing. At this point, what don’t we know about Microsoft’s new flagship phones? 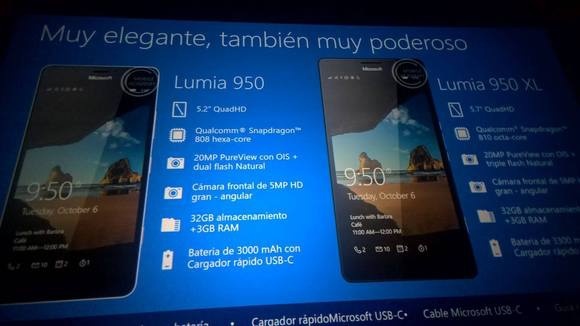 A Microsoft presentation in Spanish has described the phones in detail. Then Microsoft did, itself, on its own Store page. 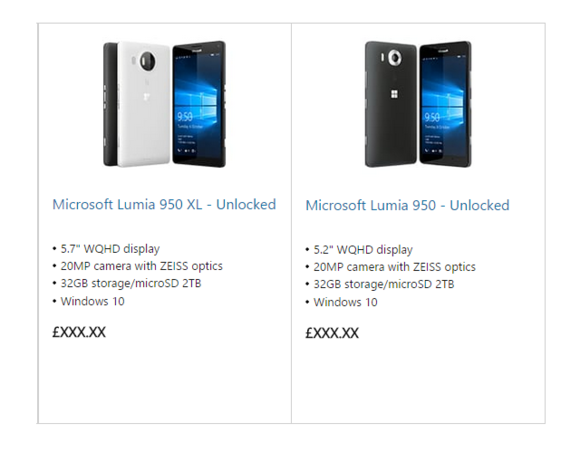 About the only discrepancy is that the midrange Lumia 550 appeared on Microsoft’s Latin America leak, while that phone was omitted from the United Kingdom’s Microsoft Store page. All of these phones will be designed to run Windows 10 Mobile, Microsoft’s upcoming version of Windows 10 for phones and tablets. Microsoft’s flagship feature looks to be Continuum, a feature that allows your phone to connect to a monitor and run universal apps—which would normally be constrained by the phone’s display—and run them at the resolution of your monitor. This effectively turns your phone into a PC, and that’s a compelling message to sell. The way Microsoft does this is via what Microsoft is calling the Microsoft Display Dock, a a small box that appears to have USB and microUSB inputs and connects to an external display. According to the slide, it will also have a Bluetooth connection built in. But Windows 10 Mobile is... kiiiind of... ready for prime time. A small group of users running preview builds, including myself, are familiar with how Windows 10 Mobile operates. But for many in the press—think USA Today, Time, and others—this may be their first experience with the new operating system. I have no doubt that Windows 10 Mobile will be demonstrated on stage, possibly with some new apps. But I will be very interested to see what OS powers the phones the press are allowed to play with, and in what context Windows 10 Mobile is referred to—as a preview, or as a finished product. I would also expect to hear updates on how Microsoft's developer tools to port Android and iOS apps to Windows 10 are progressing. Finally, there’s the question: Who will sell them? Microsoft has long said that it’s finding more success outside the U.S. with Windows Phone than within it. On Friday, Reddit noticed that T-Mobile USA had purged all of its Windows Phones from its store. Clearing out inventory? Or is T-Mobile done with Microsoft? When it launched, I felt Microsoft’s Band was a relatively useful wearable that held up well against the current state of the competition. Unfortunately, the Apple Watch debuted shortly afterward. Android Wear watches also have iterated quickly, enough that they’re arguably dominating the smartwatch market. The new, curvier, Microsoft Band. Since the Band debuted, Microsoft has given its wearable just a few updates of significance. One expected update to the Band 2 is a curved display that will help it conform more naturally to the wrist, as well as possibly some other sensors. Blair Hanley Frank, my colleague at IDG News Service, reports that Microsoft employees have also been seen wearing Band 2s with metallic clasps: chrome and rose gold. The Band epitomizes what I call Microsoft’s Nintendo syndrome: great first-party experiences, but a struggle to win third-party developer support. It's not a phone or a tablet, but Xbox is another Microsoft platform due for an update. Microsoft recently asked a small group of people to try out what it’s calling the New Xbox Experience, part of the Windows 10-ish revamp of the console’s OS, including backward compatibility with Xbox 360 games. 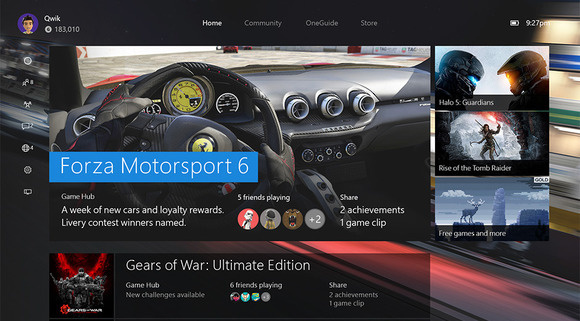 A screenshot of what the new Xbox Experience will look like. Microsoft has promised to roll this revamp out this fall; I’m part of the small group of people who have been invited to join, although, as of the time I’m writing this, I haven’t received the build yet. It's possible we'll get a peek at what's up this Tuesday. Microsoft spent about $7.2 billion to acquire Nokia’s devices business about two years ago. This week, we’ll see if it’s money well spent. Anyone who’s followed Microsoft’s hardware business, however, knows that the company can (and will) weather huge losses without long-term consequences. Two years ago, Microsoft wrote down $900 million in inventory after the Surface RT tanked. But Microsoft stuck with it, and the Surface Pro 3 now represents one of the company’s unqualified successes. We could see the same sort of resurgence in Windows phones, although I’d argue that challenge is considerably greater. We'll keep you posted on the day-of as news arises, and stay tuned for hands-on with any new devices or software that arise.